Phase Change Materials (PCM) Market size was more than USD 1 billion in 2016 and will witness 15.8% CAGR during the forecast timespan. Building and construction industry is the biggest phase change materials market end-user and will be a major growth driver over the forecast period. Increasing demand for energy saving and environment friendly technology is driving the growth of the global phase change materials (PCM) market. According to European Council on Energy Performance of Buildings, 40% of total energy is consumed by buildings for heating, ventilation and cooling in European Union and is expected to increase in the coming years. Product is becoming a popular alternative to costlier and conventional construction techniques. It bridges the gap between the time when energy is available and when it is needed and thus reduces the energy needed for cooling and space heating, at the same time improving space quality in commercial and residential applications where use of a large material mass is inappropriate. Microencapsulation of PCM market will experience a higher demand during 2017 to 2024. Product applications in textiles and shipping & transportation is expected to witness a significant growth in the near future. The product has gained substantial popularity amongst textile developers and manufacturers in recent times due to the excellent properties offered by the wide variety of paraffins and salt hydrates. Bio-based PCM market will experience a prominent growth rate during the forecast timeframe owing to its ecofriendly attributes. Eutectic is likely to witness considerable attention over the next few years as they offer combination of both organic and inorganic PCMs which can be modified and customized according to the application demand and customer requirements. The challenge to greater use of PCMs is their packaging, cost and knowledge among potential customer and user communities. Paraffins held maximum share of global PCM market in 2016. Paraffins are widely used in end-user industries such as packaging, building & construction and textiles. Paraffins consist of straight chain hydrocarbons. It forms a good phase change material for selective temperature ranges and certain applications. Commercially available and cost-effective paraffins are generally combinations of alkanes and hence do not have sharp and distinct melting points. Salt hydrates shall be the fastest growing product segment in the coming years owing to their cost-effectiveness and the niche temperature range that they cover. Building and construction industry was the largest end-user segment of PCM market in 2016. With increasing awareness among builders & construction companies regarding the bunch of benefits offered by the product, the phase change materials market size is likely to witness substantial growth in the coming years. In construction industry, PCM market can be incorporated into ventilation systems, floors, wallboards, roofs and passive heating & cooling systems. It provides an increase in heat storage capacity, especially in buildings with low thermal mass. Packaging industry is another important end-user of phase change materials market. PCMs due to their stability and consistent temperature range, help in maintaining payload’s temperature, which is very essential in packaging and shipping industry. Asia Pacific will be the fastest growing region in the phase change materials market by 2024. Rapidly developing construction and infrastructure industry in Asia Pacific, especially in countries including Japan, India, Malaysia and China, would be a prominent factor responsible for PCM market size growth over the forecast timespan. 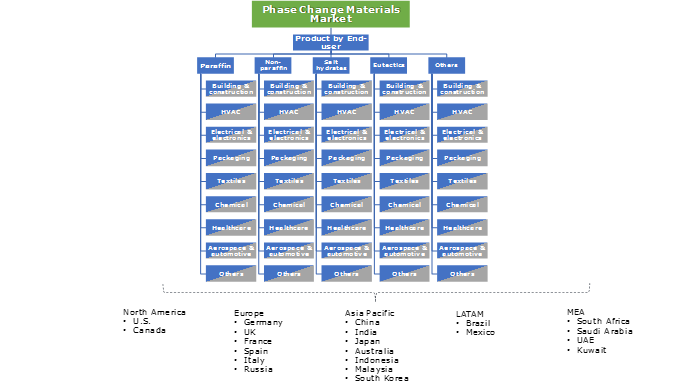 In 2016, Europe held the largest share in global phase change materials market. This is mainly due to the stringent regulations prevailing in European countries pertaining to curtailing carbon dioxide footprint and reducing other greenhouse gases emission. As the product directly aids in energy saving, this ultimately leads to less hazardous gas emission and reduction in global temperature rise. 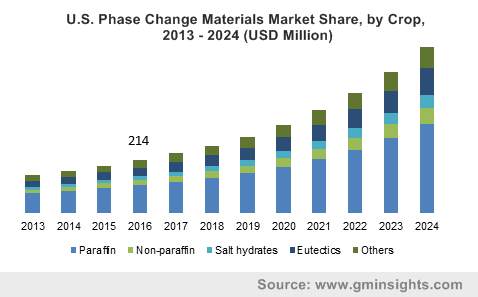 The phase change materials market is highly diversified with product manufacturers present across the globe. There are many small and medium scale manufacturers, evolved in the market that might give a tough competition to the giant players. Some of the major companies operating in PCM market segment are BASF SE, Henkel, Sasol, Phase Change Products Pty Limited, Entropy Solutions LLC, Laird PLC, Cryopak, Honeywell, Croda International PLC and The Dow Chemical Company. Major PCM market players including BASF and Entropy Solutions are working on new product developments, encapsulation technologies and improvement in latent heat storage capacity and evaluating different phase change temperature options to enhance the performance of their products. Many of the phase change materials (PCM) market players are forward integrated, i.e., they manufacture phase change materials and also produce end-products (incorporated with PCM market) such as garments, furnishings, automotive interiors, wall panels, sporting goods, etc. Some market share contributors focus on strategic partnerships and mergers & acquisitions to expand their customer reach. For instance, in August 2016, Honeywell completed its acquisition of a leading supply chain and warehouse automation solution company named as “Intelligrated”. It helped in further accelerating the company’s overall supply chain management system and enhance the operational efficiency, safety and accuracy. Phase change materials are substances that change their state from solid to liquid and vice-versa, with change in enthalpy. These materials absorb the heat and transform to liquid state. Heat is stored by phase change materials in their liquid state and as temperature falls, they release the stored heat and reverts to their solid state. The product can be either actively used or passively. In active phase change materials market application, it can be directly incorporated in substrates whereas in passive application, it can be microencapsulated and therefore utilized for various end-users. Paraffins and salt hydrates are generally used PCMs, eutectics is gradually gaining prominence in global PCM market due to the combined properties of organic and inorganic substances offered by it. Increasing need for refrigerants in packaging solutions will be fueling phase change materials (PCM) market demand over the forecast timeframe.